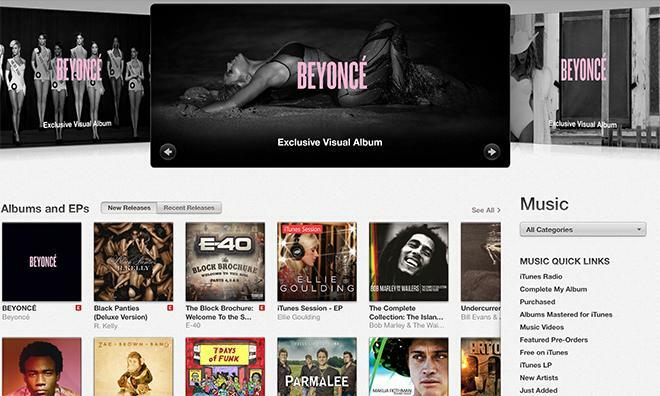 Late Thursday night, Beyonce released her fifth LP on iTunes in what is being billed as an "exclusive visual album," which has taken over the digital storefront's homepage on both Mac and iOS. For the launch of Beyonce's eponymous record, which came without prior announcement and is available exclusively on iTunes, Apple has replaced the music store's top ad carousel with promo pictures for the "visual album." The swipe-able iOS iTunes app counterpart has been similarly updated. Along with being Mastered for iTunes, "BEYONCE" is what Columbia Records is calling a visual album, as it includes album-only music videos made to complement each of the 14 new songs. Other LPs released on iTunes may include one or two music videos, but none in recent memory have debuted with fully-produced video features for every track. In additon to the matched audio/video selections are two bonus videos, one a new cut titled "Yonce" and another for the artist's current hit "Grown Woman." The latter video is a world premier that has yet to hit traditional outlets like MTV. Also included are video credits and the usual digital booklet. Guest collaborators include JAY Z, Drake, Pharrell Williams, Timbaland, former Destiny's Child member Kelly Rowland, Justin Timberlake and Beyonce's daughter Blue Ivy, among others. "BEYONCE" is priced at $15.99 and is available in both clean and explicit versions. Individual songs will be available to buy on Dec. 20.